Otto Adolf Eichmann was born on 19 March 1906 in Solingen, Germany. In 1913, the Eichmann family moved to Linz (Austria), where Adolf Eichmann was educated. His education incomplete, he left school in 1921. He worked at a variety of jobs, the most successful being as a sales representative for the Vacuum Oil Company. At the prompting of a family friend, Ernst Kaltenbrunner, he became a member of the Nazi Party in April 1932 (NSDAP number 899895). He was dismissed from his job with the Vacuum Oil Company in 1933, by which time he was already a member of the SS (SS number 45326). Eichmann left Austria for Germany in August 1933, where he underwent military training. He applied for a transfer to the SD and was accepted in September 1934, taking up a position in the SD main office in Berlin, headed by Reinhard Heydrich. Over the next months, Eichmann immersed himself in the bureaucratic world of files and card indexes. He was a diligent and efficient worker, who achieved steady promotion, eventually reaching the rank of SS-Obersturmbannführer. In 1935, Eichmann was moved to Department II/112, the Jewish office within the SD. See his Personalbericht from 1937! By dint of much effort, he was eventually recognized as the SD's "expert" on Jewish affairs, and in that capacity was sent to Vienna in 1938 following the Anschluss, to organise Jewish emigration, a task he performed with such ruthless efficiency that he was subsequently called upon to conduct a similar operation in Prague. On 27 September 1939, Himmler created the RSHA (Reichssicherheitshauptamt – Reich Security Main Office), unifying the existing conglomeration of security services and police into a single command headed by Heydrich. Eichmann now reported to Heinrich Müller, the chief of the Gestapo, who appointed Eichmann head of the Central Office for Jewish Emigration from the Reich, operating from Berlin. With the outbreak of war, Eichmann oversaw a fundamental change in policy – from "voluntary" emigration to forced deportation. During 1939-40, he and his team, which was to eventually include men such as Franz Novak, Rolf Günther, Dieter Wislicency, Otto Hunsche, Hermann Krumey, Theodor Dannecker and Heinz Röthke, amongst others, were responsible for the dumping into the Generalgouvernement of thousands of Poles and Jews from the Warthegau, as well as the expulsion of thousands more Jews from the Reich to Nisko, in eastern Poland. These operations provided valuable experience for the mass Europe-wide deportations that were to come. In March 1941, a reorganisation of the RSHA occurred, as a result of which the Jewish section was designated Department IVB4, with Eichmann as its head. His subsequent activities and responsibility for the death of millions of Jews following the decision to implement the "Final Solution of the Jewish Question" in 1941 have been well documented elsewhere. With the defeat of Germany in 1945, Eichmann, whose criminal activities were scarcely known at that time, escaped from Ober-Dachstetten POW Camp and went into hiding in West Germany. Under an assumed name, he worked first as a forester and then as a chicken farmer, before in 1950, following the trail of many other Nazi fugitives, he migrated via Italy to Argentina. There, the Fascist regime of Juan Peron was only too ready to welcome him and his kind. Now under another assumed name, Ricardo Klement, he awaited the arrival of his wife and two sons, who eventually joined him in 1952. For almost the next 8 years, Eichmann lived modestly at a number of different locations and worked in a variety of equally modest jobs. By the late 1950's, the centrality of Eichmann's importance in the programme to exterminate the Jews had emerged. After a tortuous process, the Mossad (Israeli Secret Service) was able to prove Eichmann's true identity. A team was dispatched to Buenos Aires, where Eichmann was then living, to bring him to Israel to stand trial for his crimes. In May 1960, Eichmann was abducted and flown to Israel. Over the next 9 months, he was subjected to an intense interrogation, which eventually extended to tape recordings lasting 275 hours, producing a transcript of 3,564 pages. 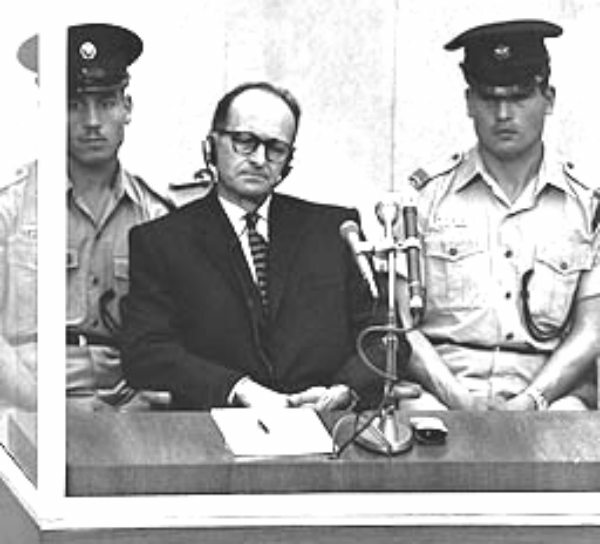 Eichmann's trial began on 11 April 1961 and concluded on 15 December 1961. Despite his unquestionably being aware of the nature of Aktion Reinhard and its consequences, Eichmann had little direct connection with that operation itself. Nor was he an instigator of Nazi extermination policy, which was dictated by others. His administrative position of Referent and his rank in the SS clearly indicate that he was only able to issue orders and instructions based upon the authority vested in him by others. But he was an able and enthusiastic executor of that authority, who pursued his appointed task with a zeal that eventually bordered on fanaticism. Although with the benefit of subsequent research, particularly since the availability of archival material from the former Soviet Union in the 1990's, it is possible to see that the prosecution's evidence against him was in some cases flawed, and that certain witness testimony, whilst of enormous historical significance, was of little or no relevance to Eichmann's activities, the magnitude of his crimes and the question of his guilt were never in doubt. He was sentenced to death. An appeal against the sentence having failed, he was hanged at midnight on 31 May 1962. It remains the only death sentence to have been carried out in the history of the state of Israel. Eichmann's body was cremated in a temporary facility that bizarrely replicated the scenes at Auschwitz, Chelmno, Belzec, Sobibor, Treblinka, and Majdanek. His ashes were taken in a launch to a point outside Israeli territorial waters and cast into the Mediterranean. It is impossible to overstate the importance of Eichmann's trial in the historiography of the Holocaust. For 15 years, there had been little meaningful discussion of the subject. The trial stirred a new generation into examining the topic in depth for the first time. It began a process of research and scholarship that continues to this day, and not least, provided the impetus for many of the subsequent trials of Nazi criminals in Germany. In May 1960 Adolf Eichmann was interrogated by Avner W. Less, a captain in the Israeli police. Eichmann admitted during the interrogation that at a meeting with Heydrich, he was informed that the "the Führer has ordered the physical extermination of the Jews". Heydrich ordered Eichmann to visit Odilo Globocnik, the SS- und Polizeiführer im Distrikt Lublin, who had already been authorised by Himmler to begin this task. Eichmann was to report on Globocnik's methods. Heydrich thought Globocnik was using Russian anti-tank trenches for the mass shooting and burial of Jews. 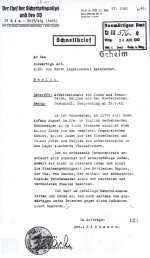 Eichmann initially dated receipt of these orders to the late summer or early autumn of 1941. There is circumstantial evidence that there was possibly a delay of 2-3 months between Eichmann receiving his orders and his visit to Lublin. In any event, there is no doubt that Eichmann did go to Lublin and reported to Globocnik, who instructed Hermann Höfle, a member of the Aktion Reinhard staff, to show Eichmann around. Eichmann and Höfle went from Lublin to Belzec. Eichmann described the site; there were patches of woods, and a highway passed through it. On the right hand side of the road there was an ordinary house, where the men who worked at the camp lived. A captain of the regular police (Ordnungspolizei) welcomed them. This was Christian Wirth. A few workmen were still there. Wirth took off his jacket, and rolling up his sleeves, joined in the work. Two or three small wooden shacks resembling two or three room cottages were being erected. Höfle told Wirth to explain the installation to Eichmann, which he did. Wirth told Eichmann that he had made everything airtight. It seemed that they were going to connect a Russian submarine engine to the buildings and pipe the exhaust fumes into them, gassing the Jews inside. Eichmann told Less that he was "horrified" by this prospect. Eichmann was unsure (probably deliberately) whether it was Belzec or Treblinka he had visited, but the dating makes it certain that it was Belzec. Eichmann stated that "it was in the latter part of 1941 that I saw some of the first preparations for the annihilation of the Jews", but the visit was probably at the beginning of 1942, when the gas chambers were finished and awaiting the arrival of the first transports to the camp (see Aktion Reinhard and the Emergence of "The Final Solution" for an alternative interpretation of Eichmann's visit). His visit to Belzec was connected with the start of the deportations of Czech Jews from Terezin (Theresienstadt) and the mass deportation of Jews from Slovakia, both to the Lublin district. Between March and June 1942, the Jews from the Czech and Slovakian regions were deported to transit ghettos in Izbica, Zamosc, Rejowiec, Chelm, Piaski, Lubartow, Miedzyrzec Podlaski, Deblin and Opole Lubelskie, to the concentration camp at Majdanek and directly to Sobibor. The total number deported amounted to 14,000 Czech and 39,889 Slovakian Jews, of whom 6,900 Czech and 9,700 Slovakian Jews were murdered in the Belzec gas chambers. Heinrich Müller, the head of the Gestapo, next ordered Eichmann to report on the use of gas vans at Chelmno, where he witnessed the vans in operation, a sight Eichmann claimed to find nauseating. Following this, Müller sent Eichmann to Minsk, where he saw a mass shooting conducted by Einsatzgruppe B. He returned via Lwow, passing by a killing site where blood spurted from the burial pit "like a fountain." Continuing his tour of murder sites, Eichmann then received orders from Müller to pay another visit to Globocnik, whom he saw in Treblinka, where the gassing installations were in operation. Eichmann expected to see a wooden house on the right hand side of the road with a few more wooden houses on the left, as he remembered from Belzec. Instead, again accompanied by the same Sturmbannführer Höfle, he arrived at a camp with a replica railroad station bearing a sign saying "Treblinka". It resembled the type of station that might be seen anywhere in Germany. Eichmann said that he hung back as far as he could during the gassing. He didn’t push closer to see it all. He saw a footbridge enclosed in barbed wire and over that footbridge a file of naked Jews was being driven into a big house to be gassed. Since it is known that the fake railway station at Treblinka was only constructed in late December 1942, Eichmann's visit can be dated as being sometime in 1943. Eichmann also admitted that after the Wannsee Conference, Heydrich instructed him to provide ex post facto written authorisation to Globocnik regarding the killing of Jews as part of the "Final Solution". Eichmann admitted during his trial that he visited Belzec and Treblinka, but strenuously denied having ever been in Sobibor. A number of witnesses claimed to have seen him in Sobibor (for example Moshe Bahir), sometimes accompanying Himmler, who certainly did visit that camp, but the witness testimony did not withstand scrutiny. 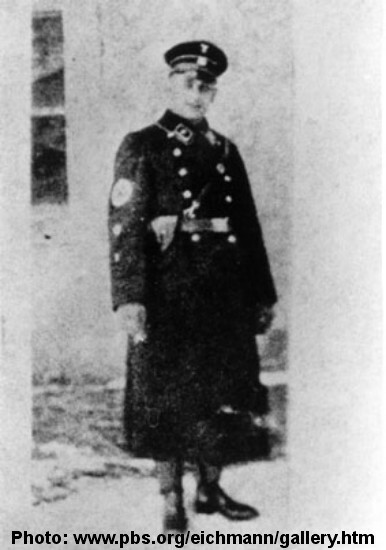 Jacob Frank, a Jewish native of Lublin, was the SS-designated supervisor of the tailoring department at the Lipowa Street Labour Camp in Lublin. He recalled a 1942 inspection of the Lipowa Street labour camp, that involved Eichmann, who was escorted by Globocnik, Maubach, Mohwinkel, Schramm, Klein, Hantke, and the SS-Standartenführer von Alvensleben. Eichmann certainly paid other visits to Lublin. For example, Globocnik and Eichmann met in Lublin again on 9 July 1943, after Globocnik asked Eichmann to bring a pass for Walter Caspar Többens, a German businessman who employed 4,500 Jewish workers in his Warsaw ghetto workshops. In a message dated 24 August 1942 from Globocnik to Rolf Günther (Eichmann’s deputy in the RSHA department IVB4) concerning the evacuation of Rumanian Jews, it was stated that all deportation trains should be directed to Trawniki, from where further distribution would take place. The police decode is legible, but not of a quality good enough for reproduction. 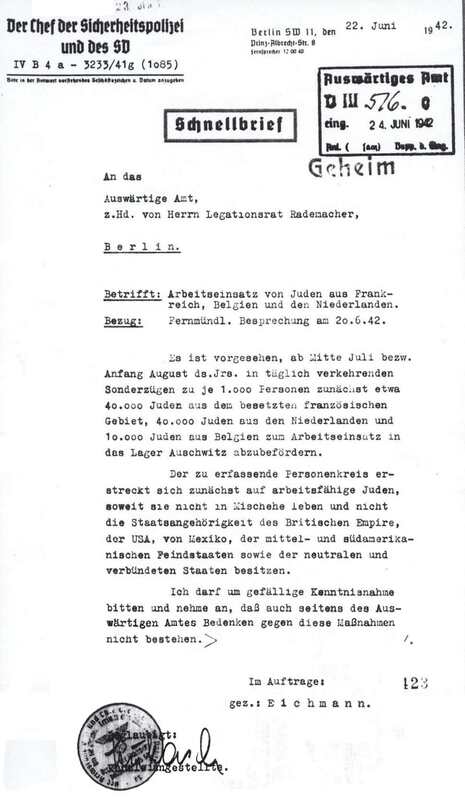 A conference was held at the Ministry of Transport in Berlin on 26 and 28 September 1942 to discuss the transportation requirements for the deportation of an additional 600,000 Jews from the Generalgouvernement and the expulsion of 200,000 Jews from Rumania to Belzec. The conference was attended by either Eichmann or Günther, Steir (GEDOB), and headed by Klemm (Ministry of Transport). insofar as this is practicable and the required number of freight cars are available. With the reduction of the transports of potatoes, it is expected that it will be possible for the special train service to be able to place at the disposal of the Directorate of the German railway in Krakow the necessary freight cars. Thus the train transportation required will be available in accordance with the above proposals and the plan completed this year. The deportation of the Rumanian Jews to Belzec did not materialise, due to a number of factors, including internal squabbles within the Rumanian administration, a protest submitted by the United States to the Rumanian government in September 1942, and various efforts by Jewish leaders within Rumania. 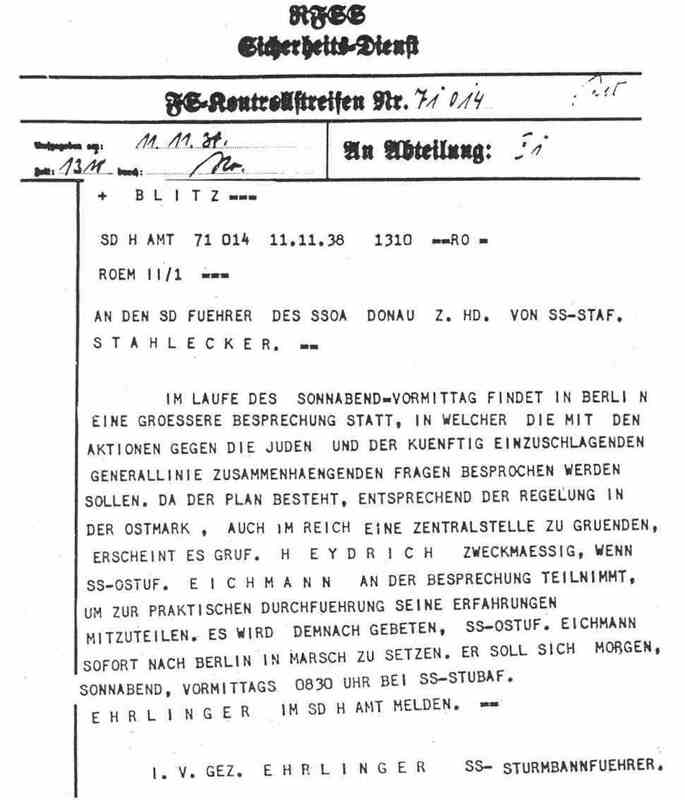 One of the most important messages partially intercepted by the British was the year- end report on Aktion Reinhard, sent by Höfle to Eichmann on 11 January 1943 and marked Geheime Reichssache. 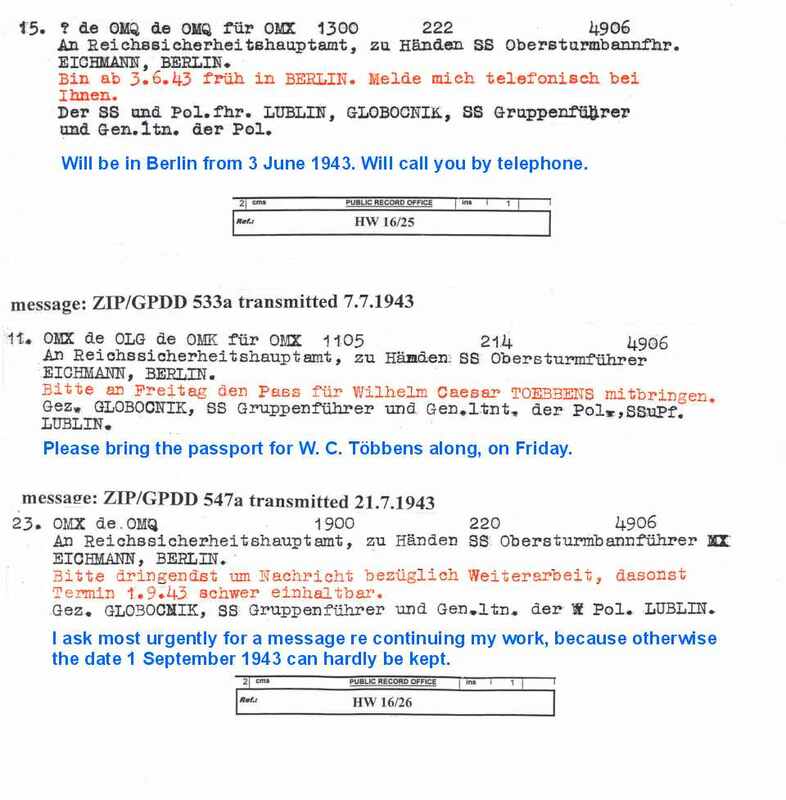 A second message to SS-Obersturmbannführer Heim, BdS Krakow, was probably identical, and whilst coded, indicates the number of victims of Belzec, Sobibor, Treblinka and Majdanek for the calendar year 1942. Eichmann Interrogated. Jochen von Lang, Da Capo Press,1999. Hitler’s Man in the East – Odilo Gobocnik. Joseph Poprzeczny, McFarland 2004. Public Records Office – Kew. Belzec, Sobibor, Treblinka.Yitzhak Arad, Indiana University Press,1987. Bundesarchiv in Ludwigsburg, II-208 AR 643/71, The documents of the investigations against Karl Streibel and others, Vol. IV. Migracje ludnosci w dystrykcie lubelskim w latach 1939-1944 (Migrations of the population in the Lublin District in the Years 1939-1944). Janina Kielbon, Lublin, 1995. Fateful Months – Essays on the Emergence of the Final Solution. Christopher Browning, Holmes & Meier, 1991. Eichmann – His Life and Crimes. David Cesarani, William Heinemann, 2004.